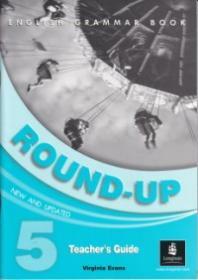 Round Up is a 7-level series for young learners from beginner to upper-intermediate. It combines games and fun with systematic practice of English grammar. -Teacher's Guide includes answer keys and extra photocopiable tests. Fotografiile cartilor prezentate in acest catalog online au caracter informativ si pot exista diferente intre aceastea si cartile respective. Informatiile despre cartea "Round Up 5 Teacher's Guide - Virginia Evans" sunt informative, pot fi schimbate fara instiintare prealabila si nu constituie obligativitate contractuala.